I have been in many meditation seminars and in all of them what people taught me about meditation was that the purpose of meditation was to stop the flow of thoughts. With time I understood that, to say this about meditation is very insufficient. Meditation for me is not about stopping the flow of thoughts, it is about witnessing the flow of thoughts in me, while detached from them. When you are able to do this, then something magical starts to take place: you start meditating! The word Meditation is a composition of 2 words: “me” and “dictation” or “telling”. When you start meditating something starts “telling” in “me”, or, in other words, something starts speaking within you and you remain there, listening, as a student, and as a channel of something higher that exists through you. You can think about beautiful beaches, great places, birds and flowers, and that might take you to great places of relaxation. That might be what you need in that moment, but if you don’t become the witness of your thoughts without judgment, you will miss the final part of the process of meditation: full connection. 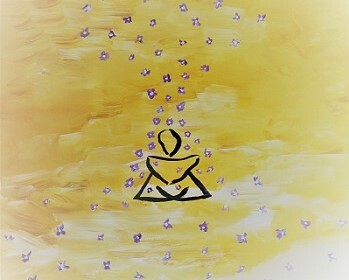 You don’t need to be seated in a lotus position… it can happen anywhere… it can happen while you are painting art, doing your housework, taking a walk… anywhere… anywhere you feel good, free, connected, non-judgemental and detached. This is way more helpful than antnhiyg else I’ve looked at.